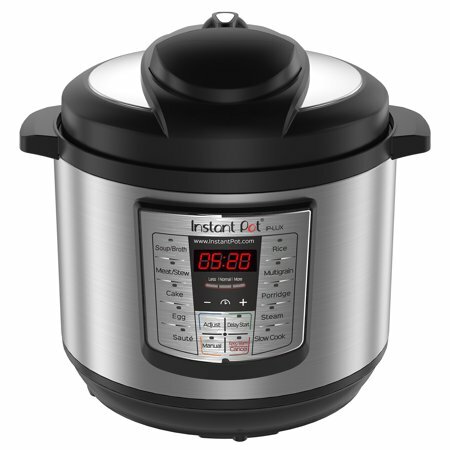 Hurry over to get this Instant Pot 8 Qt 6-in-1 Multi-Use Programmable Pressure Cooker on sale for $59 Shipped (Retail $99). Instant Pot LUX80 8 Qt 6-in-1 Multi-Use Programmable Pressure Cooker combines the functions of a pressure cooker, slow cooker, rice cooker, sautee, steamer and warmer all in one easy to use appliance. This handy cooker includes 10 smart built-in programs, such as Soup/Broth, Meat/Stew, Egg, Sautee, Rice, Porridge, Steam, Pressure Cook, Keep Warm and Slow Cook, that all offer a different ability to create your favorite dishes with the simple press of a button. Built with the latest 3rd generation technology, your new pressure cooker includes an embedded microprocessor that monitors pressure and temperature while cooking, keeps time, and adjusts heating intensity and duration.